Anyone looking to get the most from the smartphone camera might be interested in a new smartphone adapter called the Vyu360 which has been designed to transform your smartphone into a 360 degree camera. The Vyu360 comes complete with its own smartphone companion application and allows you to easily capture and share 360 degree images and video, check out the video below to learn more about this new smartphone camera. The Vyu360 has taken to the Kickstarter crowdfunding website this week to raise the $30,000 it requires to make the jump into production. Pledges are available from just $19 for early bird backers and also provides beta access. Alexis Fernandez The creator of Vyu360 explains more about its inspiration and design. 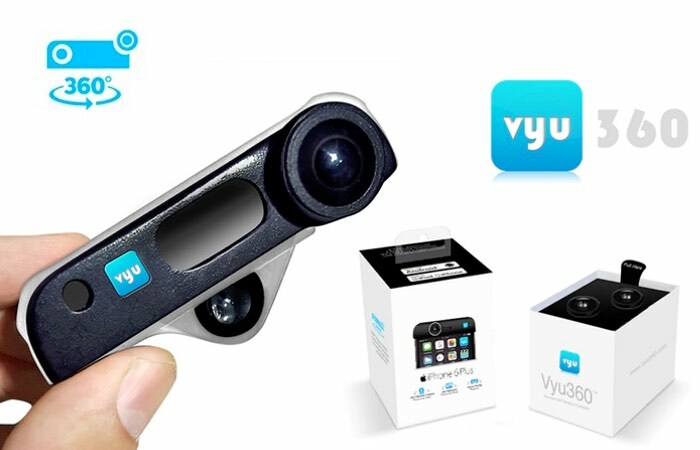 Vyu360 upgrade accessory allows you to capture 360° video and pictures by using your smartphone original front and rear cameras. The accessory is made of an elastic TPU plastic housing, with rigid rear and front lenses mount. A lens adjustment mechanism allows lenses to be aligned into position and work with different configurations. The housing can stretch and fit most smartphone, even if enclosed inside a protective case. The innovative patent pending system allows for the camera upgrade to be aligned, fitted and tuned to work with most smartphone existing cameras combination. Vyu360 is more than a social media platform or camera app. It is a whole new way to share your experiences. It is a tool that allows you to capture virtual reality glimps of your life and share them with your family and friends to fully immerse themselves as if they were there with you. For more information on the new Vyu360 smartphone camera jump over to the Kickstarter website for details and to make a pledge by following the link below.